Today, Spencer and Mark are discussing The Flash 23, originally released May 31st, 2017. As always, this article contains SPOILERS. 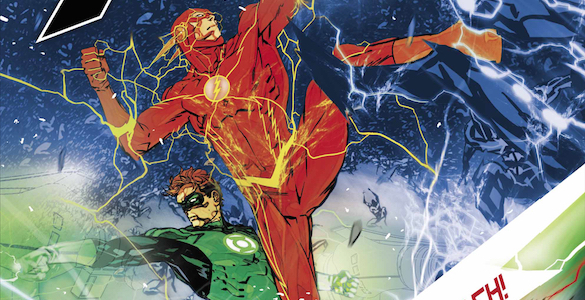 Today, Spencer and Michael are discussing The Flash Rebirth 1, originally released June 8th, 2015. Today, Spencer and Michael are discussing DC Universe Rebirth 1, originally released May 25th, 2016. Spencer: To me, one of the most interesting things about the mythology surrounding DC’s “Rebirth” initiative is that, despite its being touted as DC “canonically admitting that they screwed up the New 52,” DC didn’t take this opportunity to reboot or return to their old continuity. Instead, writer/creative director/all-around DC miracle worker Geoff Johns is using Rebirth to course correct their fledgling universe, making a concerted effort to turn away from the darkness that largely came to define the New 52 and instead embrace the ideas of love, hope, and legacy that DC was once famous for. Today, Spencer and Shelby are discussing the Flash 21, originally released June 26th, 2013. Spencer: A mystery story cannot work with only one suspect. Without false leads and red herrings, everything’s too easy; we know whodunit before the story’s even begun. In Flash 21, Kid Flash becomes one of those false leads; the problem is, Barry is the only one actually trying to solve a mystery here. Us readers already know that the Reverse-Flash is behind these murders, leaving the real bulk of this issue to be carried by the first meeting of Flash and Kid Flash. I’m not sure the two of them are up to the task. Today, Drew and Scott are discussing the Flash 20, originally released May 22nd, 2013. Today, Shelby and Drew are discussing Teen Titans 16, originally released January 30th, 2013. This issue is part of the Death of the Family crossover event. Click here for complete DotF coverage. Today, Mikyzptlk and guest writer Pivitor are discussing Red Hood and the Outlaws 16, originally released January 23rd, 2013. This issue is part of the Death of the Family crossover event. Click here for complete DotF coverage. Mikyzptlk: As we all know, there are A LOT of comics out there competing for our dollars. Books like Scott Snyder’s Batman or Brian Azzarello’s Wonder Woman attempt to push the boundaries of reader expectation and deliver tales that are legitimately astonishing to behold. I’ve given two examples from one publisher from barely over one year of publishing, but there are even more possibilities just as astounding from publishers such as Marvel, Image, Vertigo, IDW, Oni Press, Archaia, and more! That said, not every comic is great, and with so much out there to consume, it’s getting harder to convince myself to continue to spend the $2.99 a month on a book that lacks the quality of its competitors. Today, Scott and Shelby are discussing Teen Titans 15, originally released January 2, 2013. This issue is part of the Death of the Family crossover event. Click here for complete DotF coverage. Scott: “Joker is a psychopath like you’ve never seen before, but he usually likes to talk a lot before acting.” These are Batgirl’s words of encouragement that there’s still time to save Red Robin from the Joker. I’m not sure her inclusion of the word “but” is necessary; if the suspense thriller genre has taught us anything, it’s that being a psychopathic killer and talking for too long go hand in hand. But the Joker really takes it to a new level in Teen Titans 15. The lasting image of this issue is that of the Joker wheeling out a chalkboard to help explain the complexity of his evil plan to Red Robin. Today, Drew and Shelby are discussing Red Hood and the Outlaws 15 originally released December 19th, 2012. This issue is part of the Death of the Family crossover event. Click here for complete DotF coverage.